This paper surveys the phenomenon of people who had visionary encounters with spirits and who used their relationship with their spirits for political purposes. It covers the period between Joan of Arc (d. 1431) and Joanna Southcott (d. 1814). These people, and others discussed in the paper, were not â€˜shamansâ€™ in any strict sense, but our understanding of them may be enriched by asking questions about them that one might ask about shamans. Instead of concentrating on the visionariesâ€™ message or activities, the paper looks at how they, and others around them, understood their visions ontologically. Some of them even enacted trance rituals in public. Most were women, whose visions empowered them to claim public attention. The heyday of the political visionaries may have been between about 1400 (though there were also earlier visionaries) and about 1650. People during this period had a providential view of the world, in which God, the Devil and other spirits were assumed to intervene often in human affairs. Political visionaries did not form a wholly distinct category. Some were similar to less political visionaries like Teresa of Ãvila (d. 1582), or to political prophets who did not claim encounters with spirits. Others were similar to victims of demonic possession, who also encountered spirits, and who sometimes uttered political messages. All these people may be considered as belonging to a broad penumbra of shamanism: not shamanism proper, but with similarities to it. New theories and some doubts have arisen regarding the previous conceptual system of so-called European shamanism from research on European formations of possession, witchcraft, cult of fairies etc. The same applies to research concerning double beings such as werewolves, nightmare/mara/mora, fairy and witch, the results of which in many ways contradict the previously existing paradigm on European shamanism. Based primarily on Hungarian and other Central and Eastern European case studies, I review the types of communication present in Europe (Christian visionaries; â€˜shamanismâ€™, possession, mediumism, the communication of double beings and shapeshifters and of witches etc. ), and then I shall be seeking to answer the following questions: do these types constitute independent systems or are they local, Christianised variants of universal communication systems; how are they interrelated; how did they fuse with Christian techniques and with witchcraft. An important task is to draw certain conclusions regarding the questions of the much debated issue of the origin of the so-called European shamanism (and that of the witchesâ€™ Sabbath). How do we define and categorise the phenomena which research usually terms â€˜shamanismâ€™ or â€˜shamanisticâ€™, and how does it relate to possession or to the archaic, universal communication system of double beings? I also offer some answers concerning a few questions that remain most intensely on the agenda of Hungarian research, such as whether there exist any distinctive Hungarian traits or Hungarian types of communication systems, and how in the light of the above we evaluate the phenomena which research usually evaluates as a heritage of pre-Christian Hungarian shamanism. The culture of the Finno-Ugrians, based on the shamanic system of beliefs of Siberian origin, has long been opposed by the political and religious institutions of dominant peoples. Even today, the coexistence of ethnic shamanic tradition and majority culture causes political problems. For example, Mordvinian, Mari and Votyak ethnofuturists are met with opposition because of the fear that they may trigger separatist movements. In Russia, a more appropriate approach to shamanism is only attributable to few exponents of the literary and artistic world, from the writer Nikolay Semenovich Leskov (1831-1895) up to the avant-garde artists of the early twentieth century and those of the post-Soviet period, who are inspired by Uralic traditions. Shamanic conceptions, like a genetic code, still remarkably alive in the culture and literature of the Finno-Ugrians, reflect an ancient wisdom, that of the shamans, which is detached from political interests, and is applied to overcome peopleâ€™s difficulties. 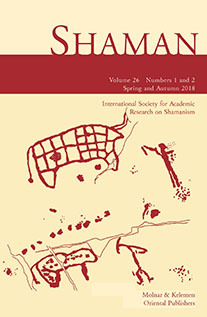 The conception of human lifeâ€”as well as of history, as an initiatory path of renovatio, based on the defence of ethical valuesâ€‹â€‹, which are of particular actuality today, including respect for the ecosystem and natural productsâ€” is due to the shamans who act as spokesmen of the collective imagination. The Siberian shamans, masters in the fight against the conflicting forces of evil, which is considered necessary for the success of the good and its complementary opposition, are now struggling against uncontrolled industrialization in the hope that their interventions may not be too late. Having recognized the power of artist as shaman, I will be presenting artists as â€œmasters in conflict transformation, techniques and strategiesâ€. I will focus on the process and affect that the murals my students and I created in the Watts Health Center in Los Angeles had on that culture, transforming it from a place of ugliness, neglect, crime, violence and fear, to a center for healing, education, and beauty. The Health Center is in the center of Watts, site of the Watts riots in 1965, still one of the most depressed areas in Los Angeles. The Health Center had lost both doctors and patients. Doctors were fearful of entering the area and the hospital, both crime ridden; and patients were alienated by the idea of medicine, hospitals, crime, etc. Drugs were stolen rather than dispensed. This visual presentation will demonstrate how a community of artists voluntarily gathered together to research, create and mount relevant imagery in the Watts Health Center that entirely changed the culture of the hospital and the area. This project was named one of the 16 most significant community projects in the US in 2009 and continues to be the inspiration of a transformational process. The recent construction of a memorial commemorating the communityâ€™s Resistance against Nazi occupation during the Second World War and the ensuing Greek Civil War, as well as the burning-down of a village in the Messogia region of Attica, has brought to the surface enduring political conflicts and tensions within the community. In the decades of apparently conciliatory politics, the memorial has provoked contradictory memories and discourses about the events which took place during the war period, offering voice to conflicting versions of â€˜historyâ€™. This picture has been further complicated by the revival of memories related to Greeceâ€™s post-Ottoman processes of nation-building and the resultant delineation of ethnic boundaries, which excluded among others Albanian-speaking Christian populations (Arvanites), whose descendants are still living in the area. Such memories and the tensions that surround them flare up during critical periods and events such as wars, dictatorships, demographic changes related to massive immigration, especially for this area of Albanians, as well as the current socio-economic crisis and the calls for the deportation of immigrants. It is in the context that certain events acquire special significance in the collective memory and consciousness of the community revealing that historical time is perceived by actors in terms of culturally-informed models rather than linearly. Drawing on a number of life histories of informants, the paper attempts to discuss the ways in which an inability to deal with traumatic events of the past leads to novel conceptualisations of evil at a symbolic/imaginary level, which themselves belong to individual, family as well as collective institutional mythologies. Furthermore, the paper attempts to uncover muted, latent and painful memories, which challenge the national hegemonic discourse, and the politics of institutionally-organised forms of forgetting. The paper focuses on Stelios Kazantzidis (one of the most popular singers of the post war period) and analyses his art, his public presence, and his impact on Greek society as a form of shamanism, which responded to the diffuse social suffering of wide social strata after the war. The construction of his song, the invention of his personality, as well as the response of the listeners are structured in ways familiar from symbolic healing, and especially from pain-healing rituals. His songs (the texts, the music, the voice) and his public image are shaped by an aesthetics of pain drawing from ritual lament and eastern ideas of martyrdom and virtue. His performances reenacted the silenced trauma of the civil war and the sufferings of post-war modernization, and produced exceptional emotional and cathartic experiences to many listeners. The singer acquired a great and faithful following, and gained the status of a social hero, a moral leader, and a caring father. His songs contributed to the construction of a new narrative for past wounds and present difficulties and exercised great ideological influence. Kazantzidis offered a conciliatory recourse to the passions of the civil war, and voiced a powerful protest for the fate of the poor and the weak, and for the social and moral decay of contemporary society. The singer articulated a conservative reaction to the rapid modernization of post-war years and he is often thought as representing an alternative, and more oriental, conception of the national character. Recently, the archive of the Hungarian/Belgian shaman and artist JÃ³ska SoÃ³s (1921-2008) has been brought together and opened for research. Although his oeuvre was already thoroughly documented several years ago by the author, the archive provides us today with new insights on his early artistic career, his continuous search for identity and the development of his personal shamanic and spiritual language in art and ritual. After leaving Hungary in the course of World War II, the young SoÃ³s started working in the Belgian mines. The archive documents the way he was firstly perceived as a â€˜miner and artistâ€™ in the French-speaking press, before he started rediscovering and promoting his shamanic heritage in his own works. Other elements prove how the artist, after moving permanently to Belgium, searched for networks that provided him with spiritual instruction and knowledge of Belgian and European art history. The archive also documents all of his exhibitions, thanks to a large collection of flyers, photographs, selling prices and other written documentation. This large artistâ€™s archive forces us to reconsider the early developments in the artistic work of the shaman and it gives us a very different overview of how SoÃ³s assimilated his traditional knowledge into a very personal form of shamanism, which eventually enabled him to survive as a shamanic artist within the context of three major cities in Belgium: Charleroi, Brussels and Antwerp. Yuri Vella (1948-2013) was a prominent Siberian intellectual, a Forest Nenets thinker and writer who attempted in his life to counteract the effects of Soviet indoctrination and to find his native voice and way of thinking. Some even called him a shaman. In this presentation, we intend to analyse his understanding of shamans and shamanhood and the complex and peculiar way he related to them, while taking into account his particular authority position in the Forest Nenets community. In his understanding there is partly a deep respect for people with spiritual abilities (as we see in his several short stories) and even a personal yearning â€“ expressed for example by the emotional importance of the drum â€“ while at the same time other signs show that he does not totally trust the way the word shamanism is used and the people who pretend to be shamans. He is clearly afraid of the superficial and commercial exploitation of the spectacular and the exotic. How does he integrate all these elements in his worldview of a Siberian contemporary leader?